Although some people may argue this point, wealth does not necessarily equate to intelligence. While affluent people may be well-versed in the industries or occupations which allowed them to gain their wealth, that does not mean they are knowledgeable in the areas of finance and investments. When a financial advisor first begins working with an investor, one of the primary tasks for that first conversation is to determine what an investor knows about investing, and what they don’t know. Some advisors find themselves educating investors on financial product values and investment strategies before any investment decisions can be made. Spectrem has examined the financial literacy of wealthy investors in a new study titled Educating Millionaires: Filling in the Blanks. The study asks investors about their financial education background, how they educate themselves on financial matters today, and whether they depend on their advisor to provide education as part of their duties. The answer to the last question is “not entirely”. Investors were asked to place their financial educational responsibility on a 0-to-100 scale, with “0” signifying themselves and “100’’ signifying their financial advisor, and the average response was 35.14, indicating that investors feel they should be able to educate themselves on matters related to their finances. However, there is a leaning toward asking advisors to have some role in their educational process. However, that response was an average of all investors. Among investors who self-describe as “not very knowledgeable” or “not at all knowledgeable”, they register a rating of 54.36, an indication that they are willing to listen to advisors who want to take the time to teach them what they need to know about their investment decisions. Investors who claim to be “conservative’’ investors also are more likely to look toward their advisors for educational support (their rating was 43.21 on the question asked above). Investors often invest more conservatively because they fear making a financial mistake, and much of that reaction might be due to a lack of knowledge about the products available to them and the risk involved. 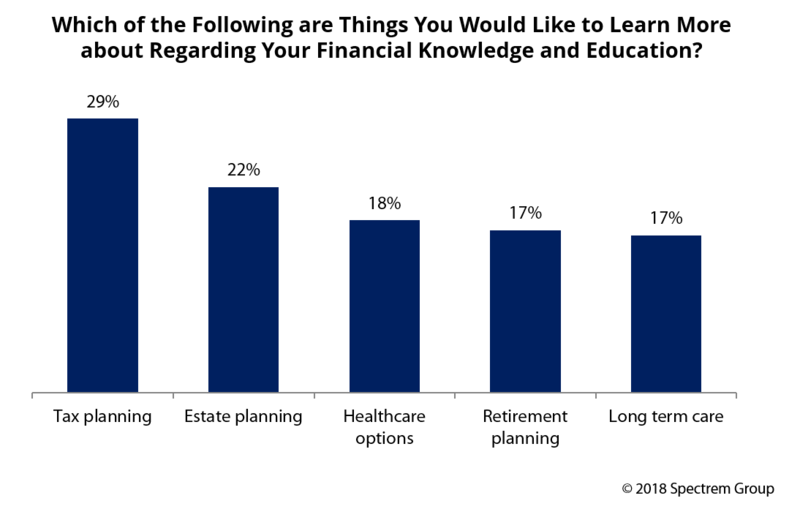 In the study, the Millionaire investors were asked which topics they needed more knowledge about, and the topic most often selected was “tax planning” (29 percent). Thirty-five percent of investors in the field of Information Technology said they needed a tax planning educational update. Advisors may believe they do everything they can to assist investors with tax planning, but apparently there is a gap in their knowledge. It is true that accountants should also be providing tax advice, but advisors can certainly help when it comes to the tax implications of investment products. The second-most popular response was “estate planning” (22 percent), followed by “healthcare options” (18 percent). Thirty-one percent of investors replied “none of the above”’, indicating they are satisfied with their level of knowledge on most financial and investment matters. So, what is the preferred method of educating investors who want to know more? While 49 percent said they prefer to do their own study, 50 percent said one-on-one conversations with advisors would help. One-quarter of all investors want in-person seminars with advisors or experts, and 22 percent said they would like to participate in webinars. When was the last time your educational materials were examined and updated? Is education an active part of your relationship with clients? The Spectrem study gives investors a test on a few key financial and investment terms to see what they know and what they don’t know. It is revealing to compare those results with the investors’ self-report on educational knowledge. Some investors think they know more than they do, and advisors need to determine where each investor is in terms of necessary financial knowledge in order to proceed properly.